So, if you follow me on Instagram or Twitter (or are ever in my general vicinity, really), I'm sure you will have realised I'm addicted to Sichuan food, and to chilli in general. 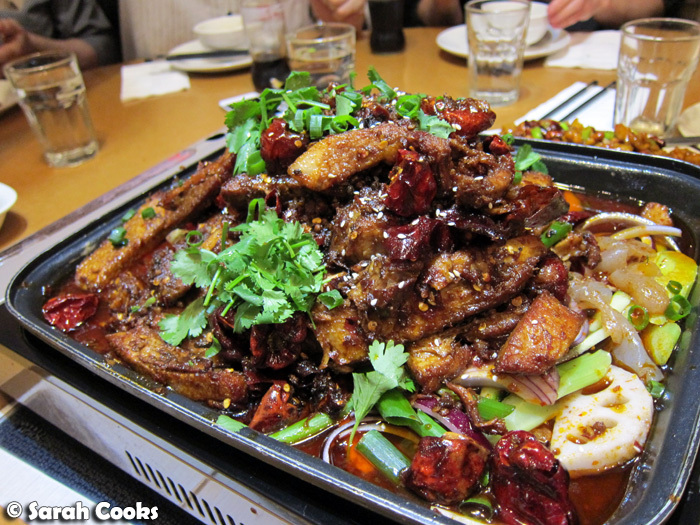 When I posted about Sichuan food back in September, it was very much a cooking post, and I even mentioned that I hadn't been that impressed by Dainty Sichuan before then. Well, that's certainly all changed! Since the Bourke Street location opened, I've visited four times and even suffer Sichuan pepercorn and chilli withdrawals if it's been a while! Definitely obsessed. 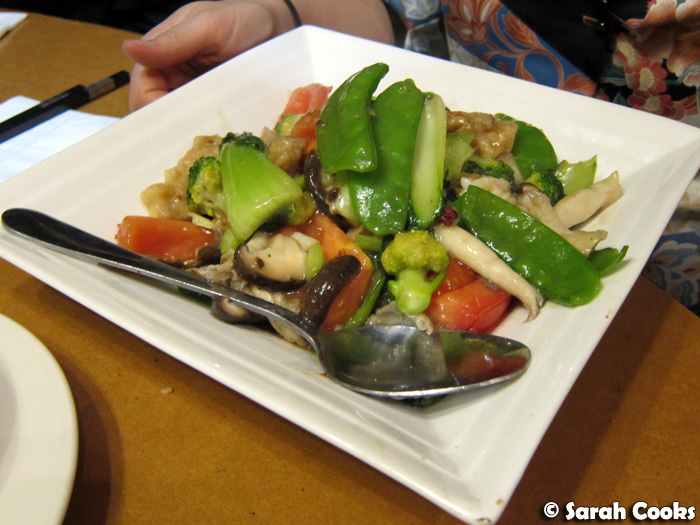 For today's post I'd like to share with you the different dishes we've tried so far. I haven't taken note of the exact prices (sorry!) but the normal dishes tend to be around $25-30, and they have a few big or deluxe dishes for about $45. Also, the portions are huge, so it's best to go in a group! 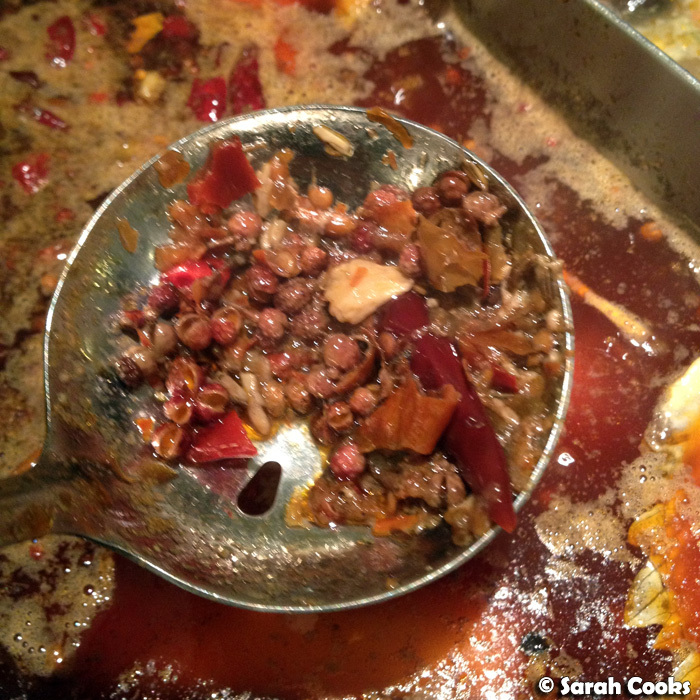 One of my favourites is the beans with minced pork. So delicious! 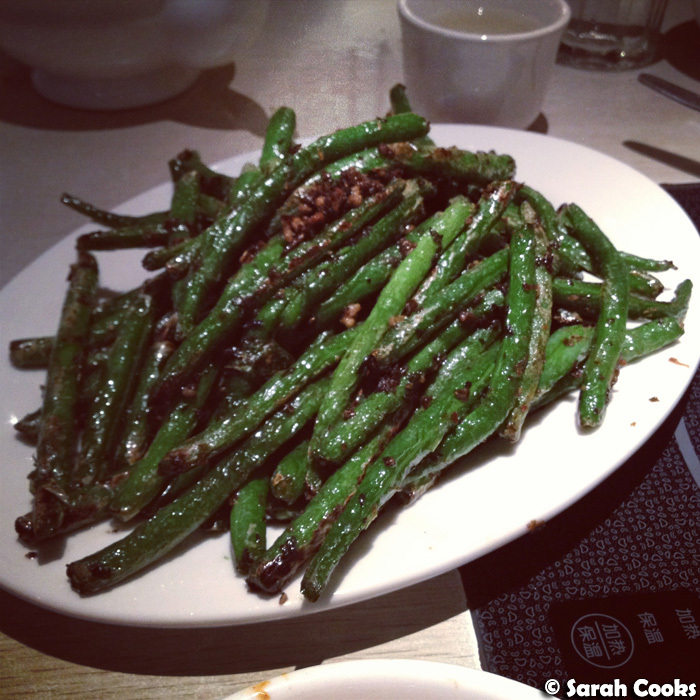 I'm pretty sure the beans themselves are deep fried, making the skin wrinkly and giving them an amazing texture, and they are positively zingy with ground Sichuan peppercorns! We always, always, order this dish! 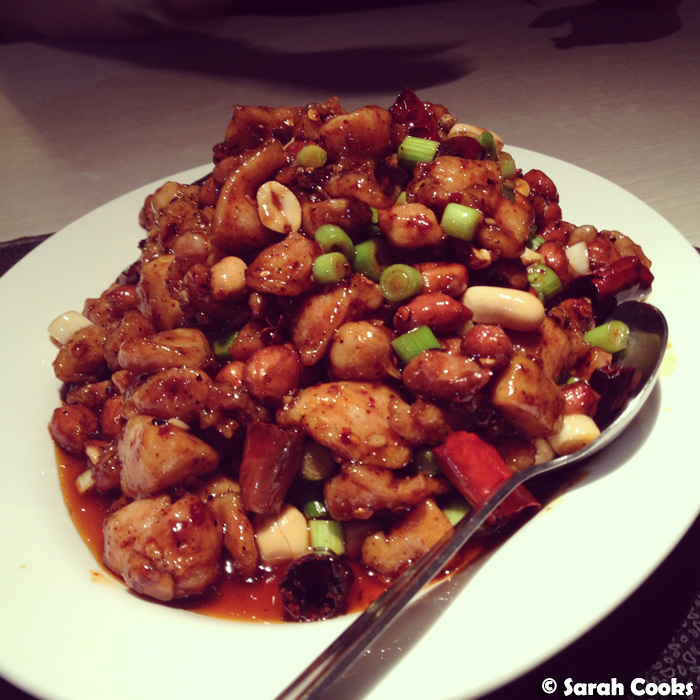 Gong Bao chicken - another favourite, this one has boneless pieces of chicken in a spicy, sticky sauce. The below picture was what we ordered for lunch for three people (eep!) when Billy came to town. It was totally a case of our eyes being bigger than our stomachs! After this lunch, I was literally eating the leftovers for a week! Phew! It also happened to be like a 38C day, so we were really grateful for Dainty's insane airconditioning! I love the lamb skewers! I think these are Xinjiang-style: in addition to the heat from the chilli, and the sour Sichuan peppercorns, these are seasoned with a hefty dose of cumin. 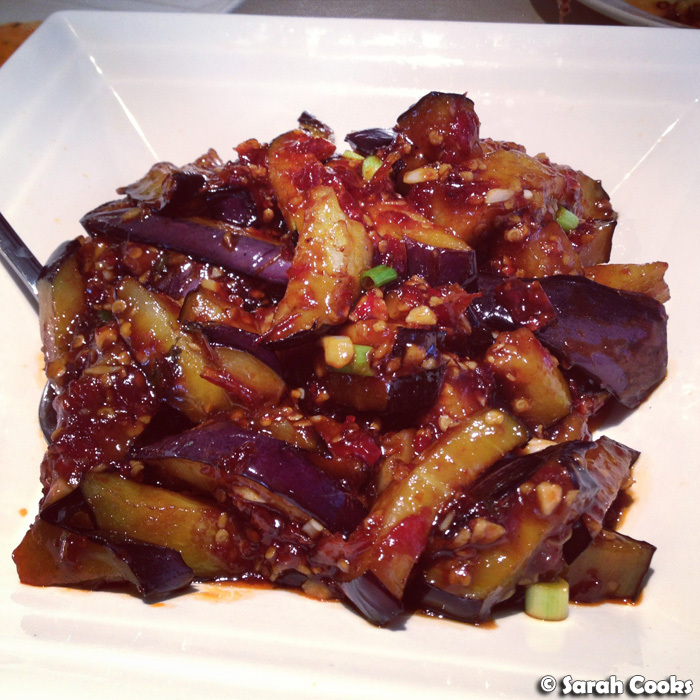 Fish-fragrant eggplant is a classic Sichuan dish, but I (immodestly) prefer my own home cooked version. Dainty's eggplant pieces were quite firm, whereas I prefer meltingly soft eggplant. Having never had hotpot before, we were totally overwhelmed by the hotpot choices, but luckily our waitress was really helpful in explaining what we should order and how it all worked. We ended up getting a small hotpot (half spicy, half not spicy), and getting a few meats and veggies to cook inside. 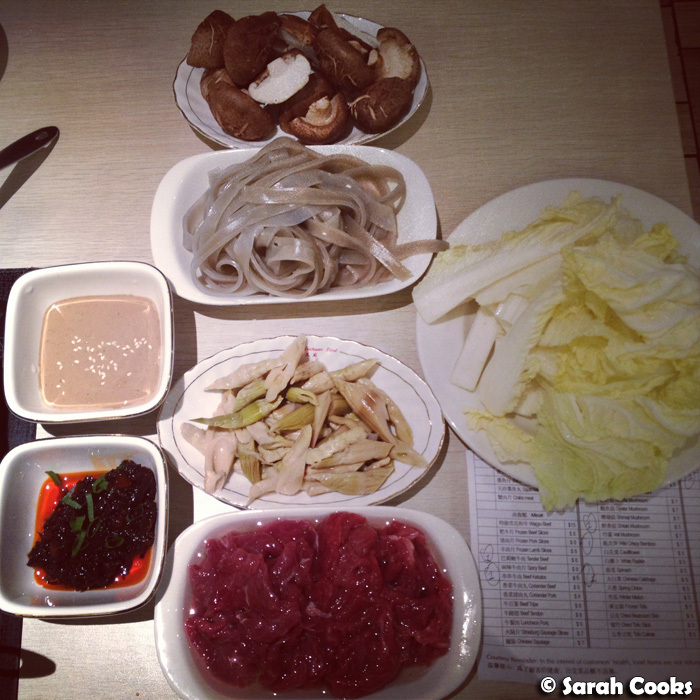 So here's what we ordered to go in the hotpot. (Plus a plate of raw beef kebabs that isn't pictured). You can see we were playing it quite safe with our choices, maybe next time I'll try a bit of offal or some vegetables I've never heard of before. Hot tip: I love potato noodles, but they're impossible to fish out of the bubbling hot broth. Also, that sesame dipping sauce is all kinds of amazing! And finally, on Saturday night I came to Dainty in a group of eleven, to celebrate my birthday! A big thank-you to my friends for enduring the cray cray spicy food and chilli sweats! (Seriously, not the most sensible idea to go to Dainty all dressed up - my makeup totally melted off and my hair deflated!) But, it was totally worth it! The below sweet and sour pork ribs weren't spicy at all, but were still quite strongly flavoured with a sticky sweet sauce, and were (from memory) about $18 for a small entree-sized plate. We got two for the table. 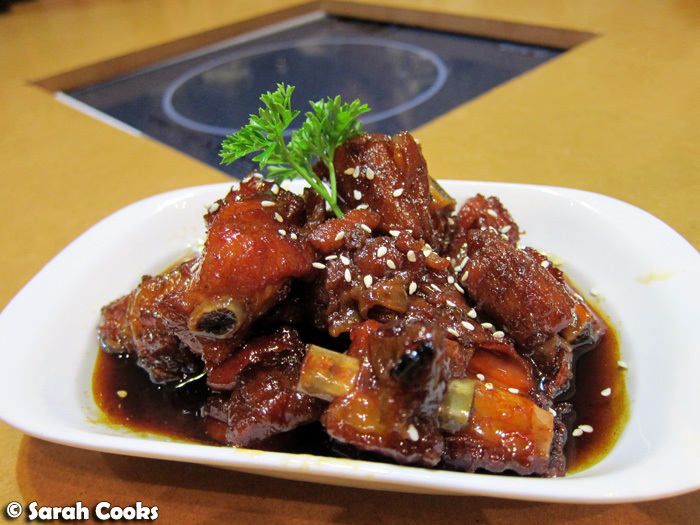 (They're similar to the sweet and sour pork ribs I made from Fuchsia Dunlop's recipe). 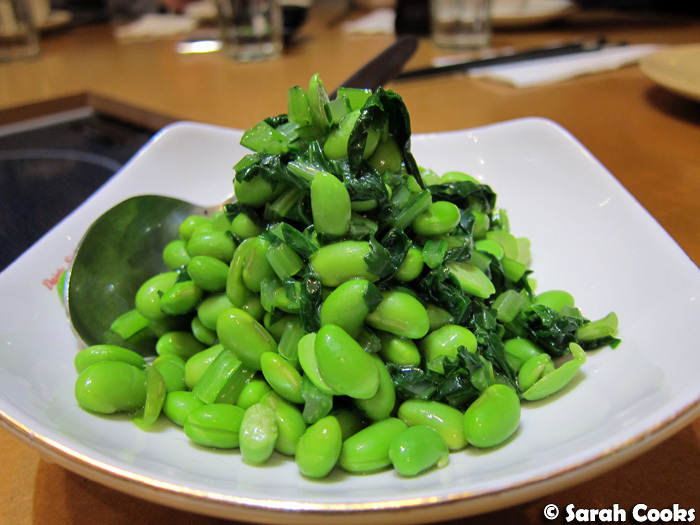 I felt we should order something green, and I loved these delicate jade-coloured soybeans, dressed with a subtle slick of sesame oil. A refreshing contrast to the rest of the dishes! Moving back to spicy dishes, my friend Wes chose the calamari, and it was great! The tentacles were pleasantly chewy without being rubbery. 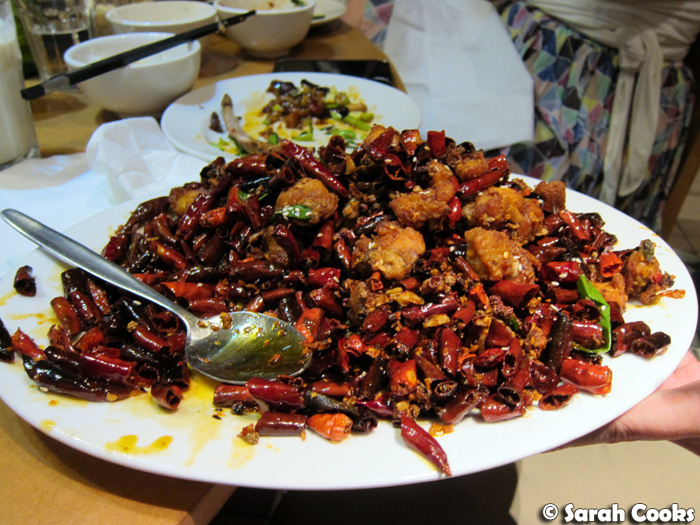 My cousin, who tries to avoid too much chilli and who actually hates Sichuan pepper, (SORRY CUZ!!!!) ordered a plate of mixed seafood and vegetables for herself, which I think she liked. Although a sneaky Sichuan peppercorn found its way in there, poor girl! Our waitress recommended we order a big dish of pork ribs (this one was about $45), as it's apparently one of their famous dishes. This massive dish came served, precariously, on a gas burner (and was nearly dropped onto our table by the waitress - oops!). But luckily nothing spilled or broke, and the dish was delicious. There were meaty pork ribs, there were tendons, there was pork fat, onions, lotus roots and more. Great recommendation! 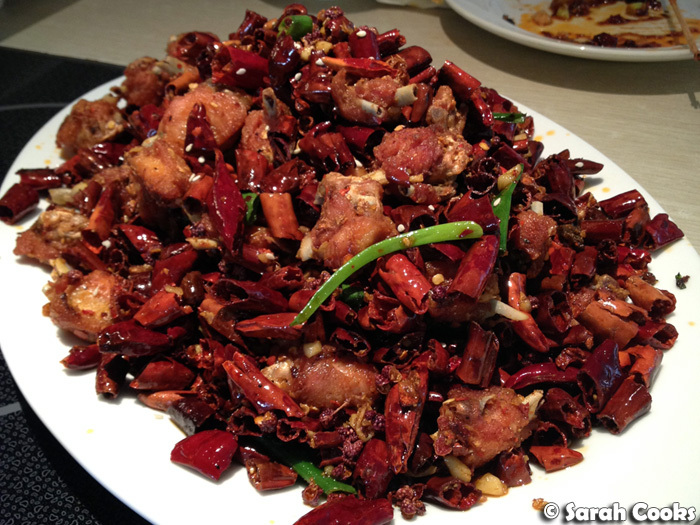 And let's just have another picture of the Chongqing Chilli Chicken because I love it and it's the most addictive of all the dishes! 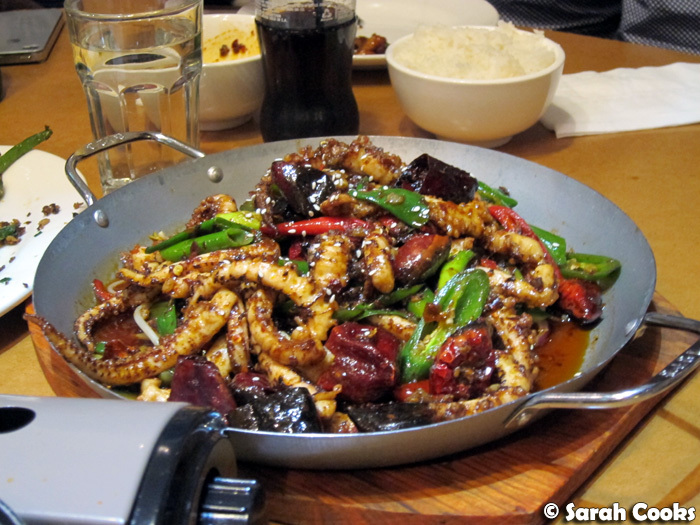 Do you have a favourite Dainty Sichuan (or general Sichuan) dish? I still want to try the "Ants climbing up the trees" noodle dish, but they don't serve it at the city location. Any must-try dishes for me? What are your favourite additions to hotpot? The Angmoh, Booo and I went just last Wed. How awesome is that BBQ Pork Rib dish! 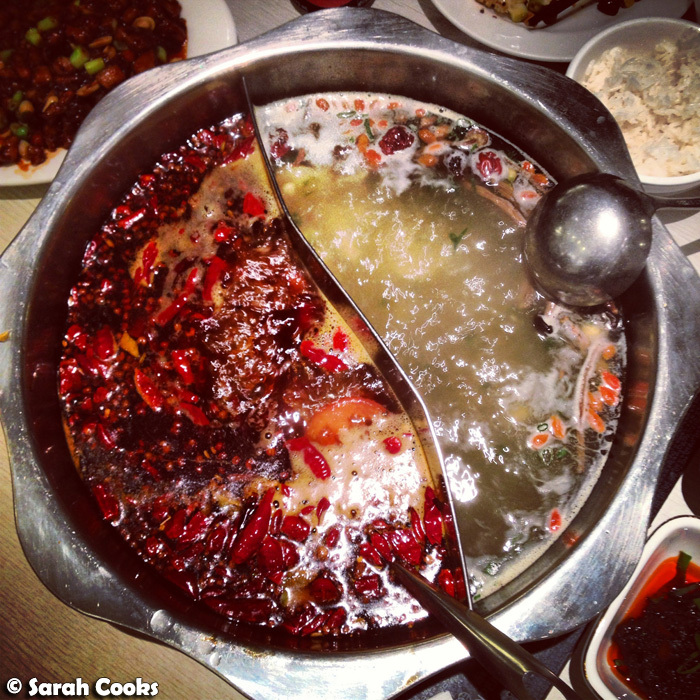 Totally love Sichuan peppercorns! 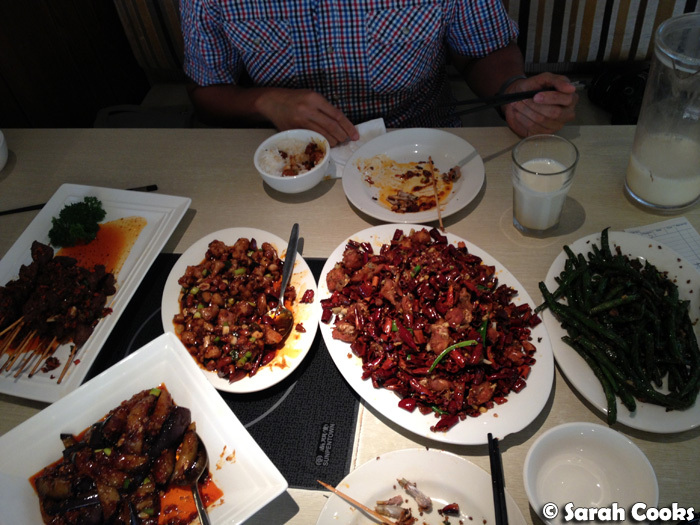 I was lukewarm about Dainty Sichuan as well until I recently went to the city one. Now I'm so hankering to go back but can never find enough chilli lovers to go with me. The dishes are so big that it makes it hard when you only have two people eating it! 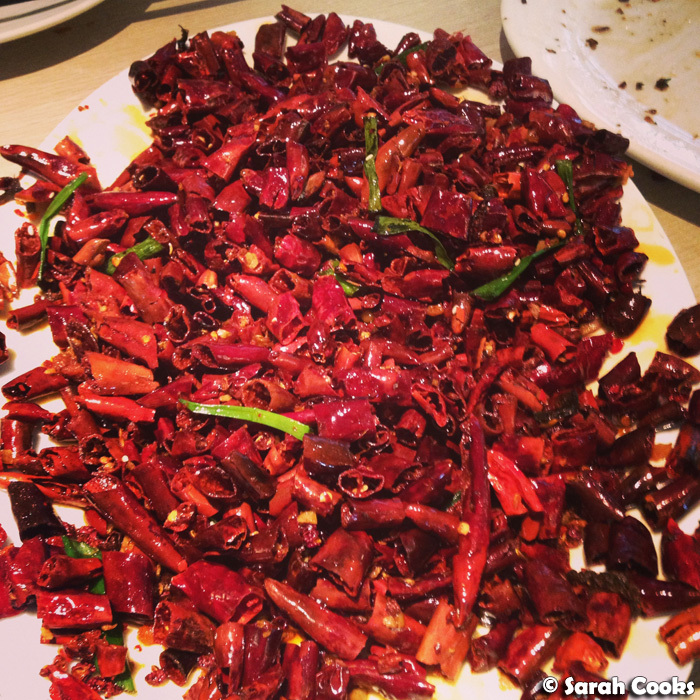 I love the abundance of dried chillies in Sichuan dishes but find that usually there's more bark than bite! lol. And I have to confess I paused at the pork rib dish, especially when I saw the words tendons and fat! lol. I needs me some of that, stat! 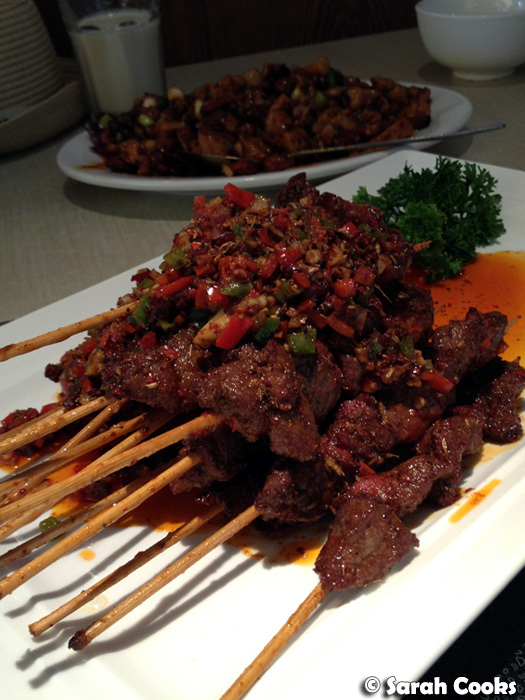 I loved the food at Dainty Sichuan but the city location feels very sterile and lacks atmosphere I think. Mmm love Dainty.. but I want to go to a place with really good ribs! Off to Spicy Dumplingwhatever that place is called in Kensington! I still feel the burn! LOL The ribs were great and didn't mind the heat (partly due to the soy been milk! )It was so worth it. Their lamb ribs served with rice is the BOMB! I wish I could get the recipe as I haven't been back to OZ for over 5 years and my craving is driving me nuts! The ribs come in a wonderful broth.